I saw Fried Ravioli over at Lisa's Dinnertime Dish, While she used it as a Appitizer we tunred it into dinner and it was just as good next day as well!! Lightly beat the eggs with a little splash of water in a shallow dish. Add about a cup of bread crumbs to another shallow dish. 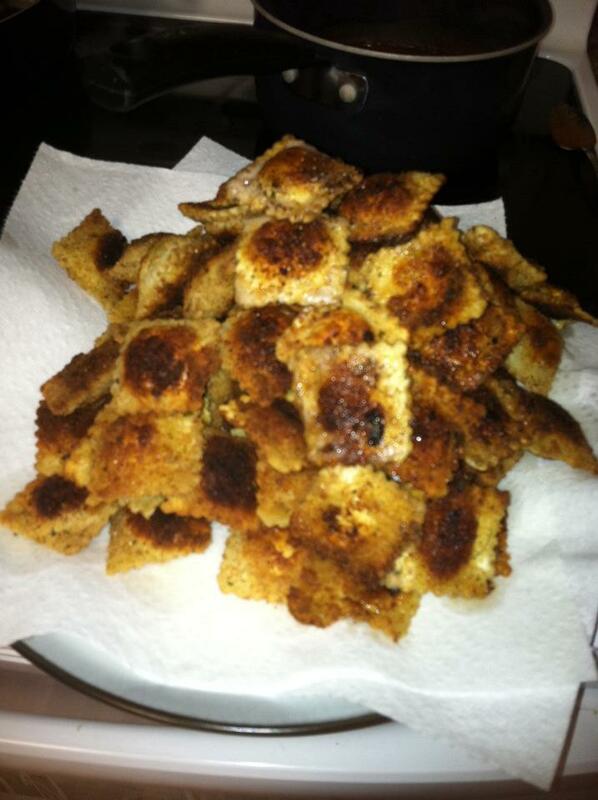 Then set up a little assembly line with the ravioli, eggs, breadcrumbs and a plate. Dip the ravioli in the eggs and then coat with the breadcrumbs. Set aside on the plate. Heat about 3 tablespoons of olive oil in a large skillet. Once the oil is hot, start cooking the ravioli in batches (you don't want to crowd the pan). Cook for about 2 minutes per side or until browned. Add more oil to the pan between batches as needed.